Dublin's John Small and Seamus O’Shea of Mayo. TODAY’S ALL-IRELAND SFC final was closely fought and the same could be said of the man-of-the-match award. 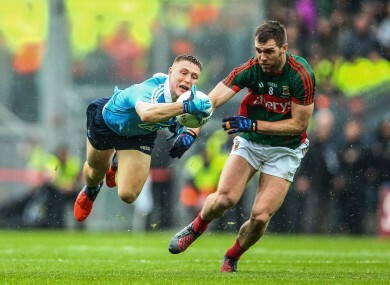 While it was a highly entertaining clash, the quality didn’t always match the excitement with both sides making plenty of errors in difficult conditions on a wet day at Croke Park. There were still some strong performers on both sides, however. For Mayo, Brendan Harrison, Andy Moran and Cillian O’Connor were among the standouts. Meanwhile, in the Dublin team, John Small, Brian Fenton and Ciaran Kilkenny gave a good account of themselves. With that in mind, what do you think? Who deserves the man-of-the-match award from today’s All-Ireland final? Email “Who deserves the man-of-the-match award from today's All-Ireland final?”. Feedback on “Who deserves the man-of-the-match award from today's All-Ireland final?”.